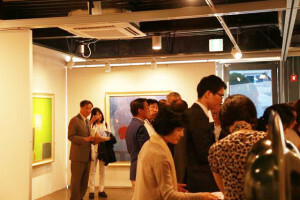 A current exhibition in Seoul Korea of Komarin paintings is intriguing indeed. Korea is a nation deeply divided. Their history has been marked by war and an enormous amount of internal conflict. They are one people divided in half. Both halves are the same. They just don’t know it. My paintings speak to all peoples of all cultures and all languages. This is indeed a good thing. The human condition is the human condition. Differences in political, religious and cultural affiliations are to a very great extent due to Korea’s geography, with these differences playing out over time. Tribes that evolved from the same genetic base but lived across high mountain peaks and deep wide rivers grew fearful of their tribal brothers, and when coming upon them, these tribes would nearly always attack and conquer. The losing tribal chief would often be beheaded. His head would be the precursor to the soccer ball as the winning tribe would kick it around the field for good measure. The antagonism of tribes was perpetuated as they reproduced and created new affiliations. How does the exhibition in Seoul Korea fit into the basic human condition? What is of interest to me is that my work appeals to collectors of a great many countries across this little blue planet we call Earth. Why? Because the human condition is the same, always has been, always will be. Humans enjoy the satisfaction of certain appetites; the love of visual beauty exists among all peoples throughout pre-recorded and recorded time. Cultures that could not yet read made images on cave walls and scratched designs on nearly any surface they could find, including their own bodies. Painting on one’s body–which has morphed over time to tattooing the skin–is yet further evidence of the very strong urge among humans to be image laden and if need be, to carry those images on their own skin. When a collector of a Komarin painting whether it be an abstract canvas, a Cake, or a painting from the French Wig series purchases that painting, they are responding to color, surface, texture and tone. The eye delights in the juxtaposition of color and shape. Language doesn’t really enter into it. When you place something sweet on a baby’s tongue, they don’t ask how to spell that sweet substance. 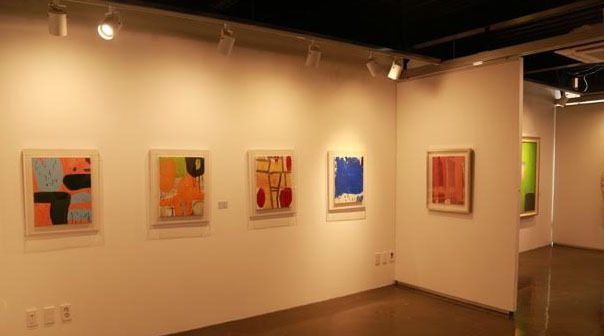 What can a viewer of the exhibition in Seoul Korea expect to see? Whether the viewer is from Korea, Brooklyn or the South of France, a Komarin painting happily speaks to the desire for visual beauty and contemplation. When Willem de Kooning did a painting he didn’t paint for Holland. He painted for himself and the world delighted in his vision. When Gary Komarin paints a painting, he too does the painting for himself. The marvel of it all is that the paintings cross tribal lines which we now address as countries and nations. 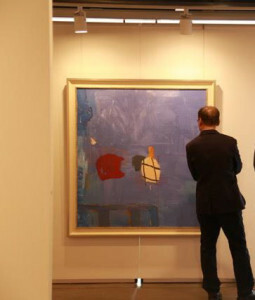 Paint that is dripped and freely brushed, abstract to one degree or another, whether with more color or less, brings a smile to the boat captain in Korea, as well as the hedge fund fellow in London. The paintings speaks, the viewer listens.